We've been hearing rumors of the upcoming Samsung Stratosphere for Verizon Wireless for a little while now, and some press shots for the device have now fallen into the hands of PocketNow. 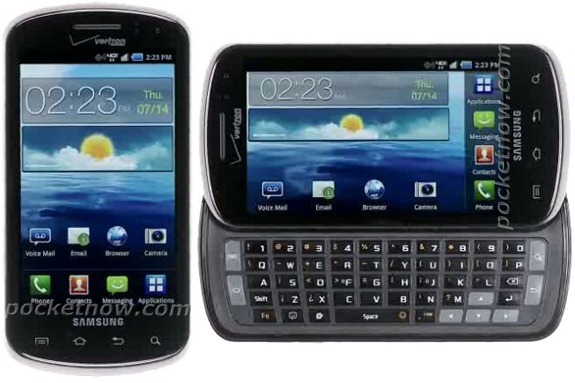 Early rumors suggested that this device could be VZW's reason for not getting the GSII, but more recently,it was compared it to Sprint's Epic 4G. After seeing the pictures, I would say that the latter is pretty dead-on, as it looks nearly identical to the Epic. While there isn't a whole lot of info on the spec front at this time, it is clear that this will be an LTE device -- and considering it's most likely a mid-ranger, I expect it to be the first affordable 4G device to hit Big Red. It's reportedly running Android 2.3.4, and could be hitting the streets as early as this week.